Game: "Ultimate Muscle: Legends vs. New Generation"
Review: As you probably know by now, I was a huge fan of M.U.S.C.L.E. figures when I was a kid, hence the reason I took the time to give names and profiles to all 233 of those pint-sized pink warriors. 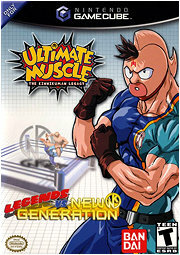 So, it should come as no surprise that I was extremely excited when Ultimate Muscle finally came out for the GameCube. True, there was a M.U.S.C.L.E. game for the NES back in the day, but that game was so absurdly awful it actually gave E.T. on the Atari 2600 a run for its money. Seriously, they couldn't have possibly done a worse job on the NES game and that's why most kids like yours truly played far better games such as Tag Team Wrestling and Pro Wrestling instead. A winner is you, indeed. Fortunately, with the GameCube exclusive Ultimate Muscle game, it's a hell of a lot o' fun and they've brought back some of our favorite classic M.U.S.C.L.E. characters - including Sunshine (aka: "Mr. Blocky"). The game is based on the Kinnikuman series and each wrestler has features the same hilarious voice actors from the anime show (for those of you who've actually seen it). It features 30 characters and a variety of unlockable ones, plus you can also create your own custom characters which often result in some of the most ridiculous matches you'll ever have the fortune of participating in. While the wrestling action itself is super-fast, it's the super moves that each character can execute which really make this one of the best multiplayer wrestling games out there. The names of the moves alone are absolute classics: "Texas Condor Kick! ", "Savannah Heat! ", "Unicorn Special! ", "Gate Of Darkness!" and more. In addition to the super move monikers, there's always a huge cartoony build-up cutscene before the move is actually executed, and it's during this time that you and your pals will be laughing your collective asses off because you know somebody is about to be on the receiving end of an inhuman pummeling of epic proportions. You haven't truly lived until you've made Sunshine, in all of his blocky goodness, transform into an inverted pyramid, fly up high into the sky and come crashing directly down into the gullet of your opponent, smiling all the way. It's moments of utter lunacy like these which remind you that you've discovered a true gem of a game. Another amusing little feature is the "Toy Mode" in which you actually get to collect old M.U.S.C.L.E. toy figures along the way. Definitely a nice nod to fans of the original toyline. While it may seem trivial to those of you who don't care about the original toys, there are some unlockable characters in there, so it's still worth checking out. While I would definitely like to see more variety in how many super-moves each player can do (most seem to have 2-3 at best), it doesn't stop this from being one of the most entertaining and fast-paced 4-player wrestling games out there. And really, who can say no to a game that offers you a chance to play characters with amazing names like Dik Dik Van Dik and Wally Tusket? Considering it's a fairly old Gamecube game now, I suggest those of you who still own the system (or those of you who own a Wii) go pick it up. It may be a cheap purchase, but it's guaranteed to entertain and bring you a ton o' laughs. I have to agree with you here, Ultimate Muscle for the gamecube was quite an enjoyable game. The voice actors from the show helped make it even more cheesy, which is awesome. Yeah it's a total blast... and I love the little bits of wisdom they provide you with whenever you start up the game for the first time. It's like cracking open a fortune cookie, but having the M.U.S.C.L.E. guys read it to you. I never got to play the Gameboy version of this game, but I heard it was pretty solid as well. Wow, I need to get this game. I miss muscle men. I used to bring them in for show and tell every week in kindergaten. these things were so ridiculous they were fantastic. i had only on e of them, and i remember seeing it in your guide. if i were you id send it to a publisher as a fanguide. youll be a real author! I remenber the Anime! It was actaully hillarious! I'll get that if I see it certainly. All I remember from the cartoon is a move called the Brazilian Nut Cracker. I've never seen or heard of this game before, which is odd, cus all through college I was really up on the Gamecube games. I imagine a game like this really shines in multiplayer, which is a bother for me since I have few local gamer friends. Still, if it's good and did well in sales, the next iteration will hopefully be just as silly, corny, action packed, and hopefully filled with internets. Looks like fun, glad you tried it out, it was the bad M.U.S.C.L.E. game for the NES that kept me away from this. Now that I know that it is actually entertaining, I might try and track down a copy. I don't think I can get this game in the Uk, but I'm gonna have a good go at finding it!! !